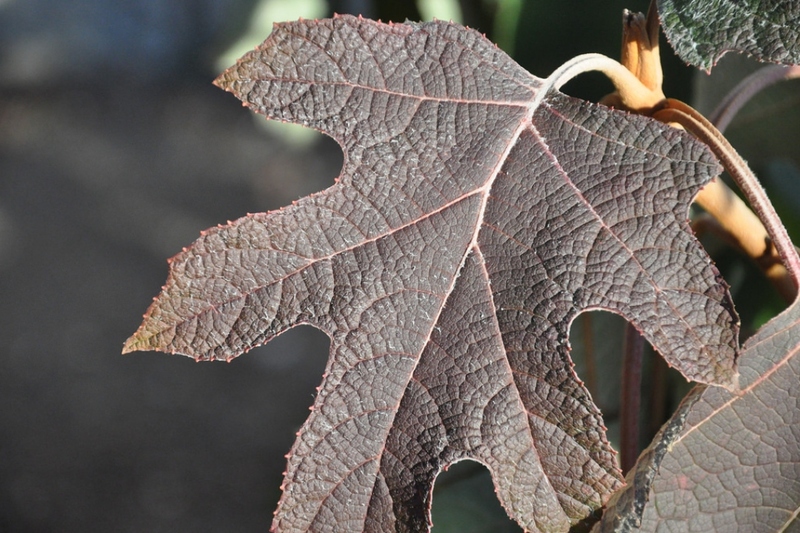 Oakleaf hydrangea (Hydrangea quercifolia): growing, planting, caring. A deciduous and hardy shrub with white showy flower heads, and a common garden plant, with many cultivars available commercially. 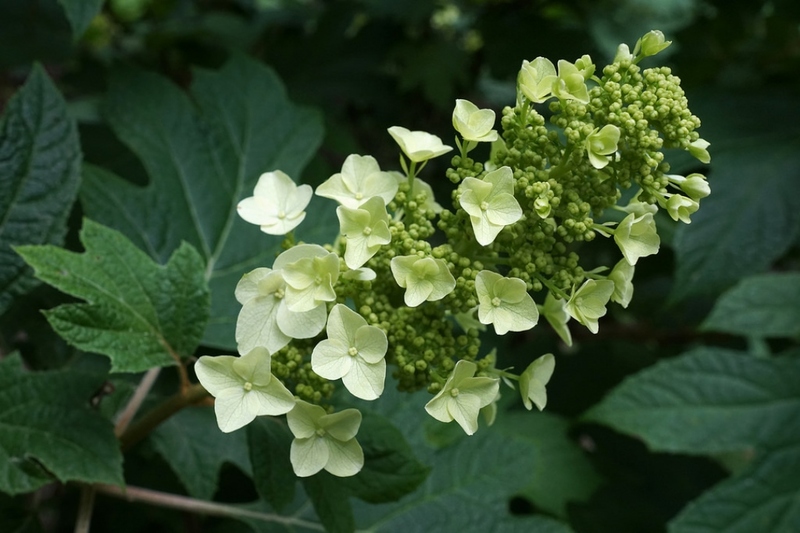 Hydrangea quercifolia -the oakleaf hydrangea - is a species of flowering plant native to the Southeastern United States. It is a deciduous shrub growing to 8 metres (26 ft) tall, with yellowish green to dark green leaves on top and silvery-white underneath, turning rich shades of red, bronze and purple in autumn that persist in winter accompanying the persistent dried flower-heads. Those are borne in erect panicles 6–12 in (15.2–30.5 cm) tall and age in colour from creamy white, to pink and by autumn and winter are a dry, papery rusty-brown. 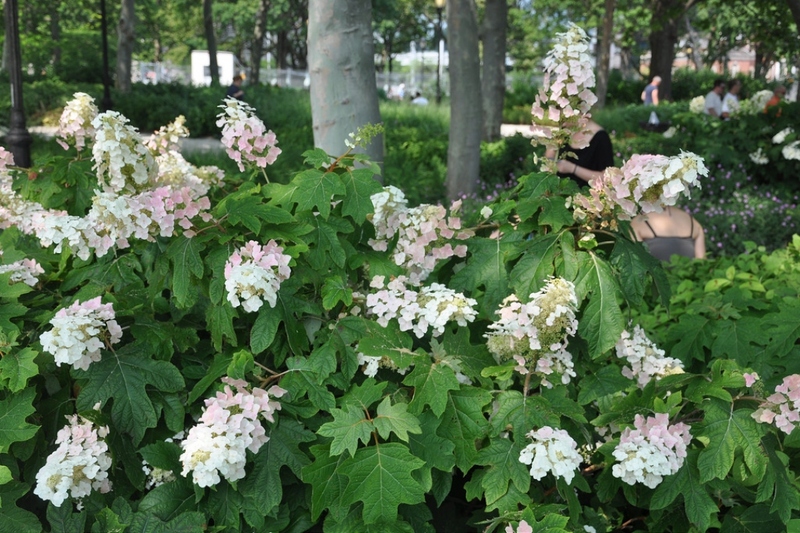 Unlike H. macrophylla, flower colour does not vary with soil pH. 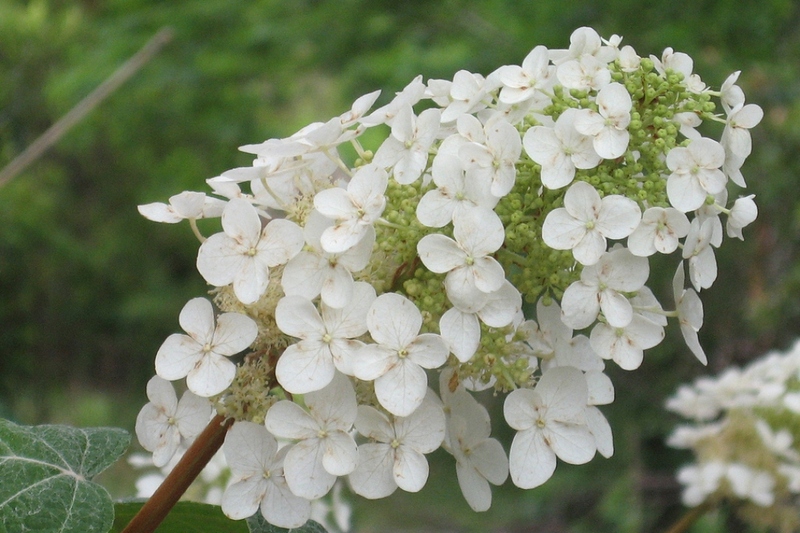 This description concerns the hydrangea - Hydrangea macrophylla - which is a deciduous shrub with close branches and dense foliage forming a large ball 1 to 2 m high, or more. 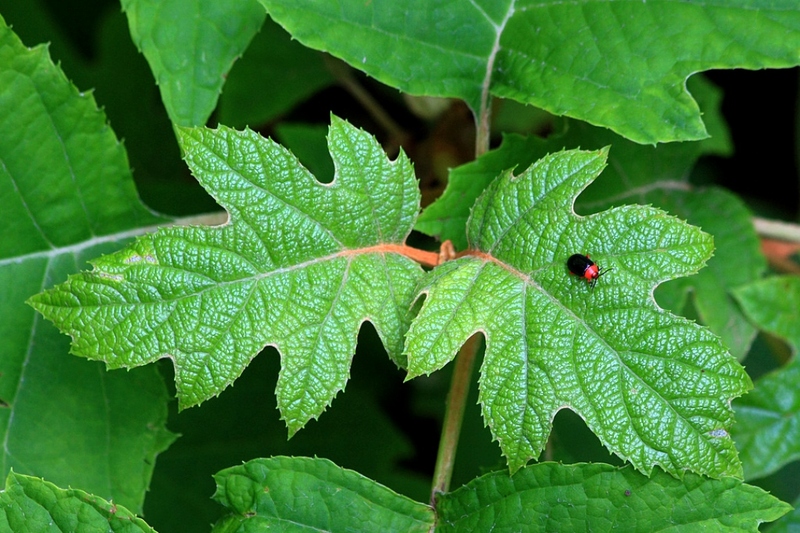 The opposite leaves can reach about fifteen centimeters in length, hence the term macrophylla, from the Greek makros, "tall" and phyllon, "leaf". They are simple, membranous, orbicular to elliptic and apex acuminate. They are generally serrated - edged with asymetrical teeth. The inflorescences are cymes of corymbous cymes, positioning all the flowers in a plane or on a hemisphere or even a whole sphere for some cultivated forms. The flowers have colors ranging from pale pink, fuchsia red to purple blue, depending on the acidity of the soil and the presence of aluminum ion. Water generously and often in spring and in summer for the first year, a little less the second, and then mostly during high heat periods and that is all: outside of particular conditions, your ground-planted hydrangea will manage very well on its own (rainwater is gentle which is perfect!) If your hydrangea is potted, you must think about it from time to time. Rather than watering the pot for long minutes, completely immerge it in a basin while you water the rest of your plants! One thing: you can provide small basins at the base of the shrubs and then spread out a 10 cm thick layer of mulch. In the spring, water in the morning, and in the summer, in the evening after the sun has set. A small problem when watering: if your tap water is too hard, you plant won't appreciate it as much! A simple solution is to collect rainwater, but that isn't only an available option for everyone... If in doubt, add fertilizer for heather from time to time to help solve the problem. If the winter is mild in your area, cut the withered flowers right after wilting. If not, wait until the end of the winter: when drying, the flower will protect the buds just below.